Dyskinetic cerebral palsy is a form of cerebral palsy primarily associated with brain damage to the cerebellum or basal ganglia, which can result in a range of developmental delays, physical difficulties, and involuntary muscle movements. The most prominent characteristics of dyskinetic CP are sudden contractions when attempting to move and posture abnormalities when resting. Dyskinetic CP is one of 4 different subtypes of cerebral palsy. The other types of cerebral palsy are spastic, ataxic, and mixed. The cerebral palsy subtypes are differentiated by the particular type of movement disorder associated with them. Spastic CP is the predominate form of cerebral palsy accounting for over 75% of all CP cases. Dyskinetic cerebral palsy is the 2nd most common CP subtype but it still only accounts for 5-6% of all CP cases. What is Dyskinetic Cerebral Palsy? Dyskinetic cerebral palsy is a form of cerebral palsy which is distinguished from other forms of cerebral palsy (spastic CP and ataxic CP) by its symptoms and the region of the brain to which damage is sustained - in this case, to the cerebellum or basal ganglia. The cerebellum is the region of the brain which coordinates muscle tone and motor function, while the Basal Ganglia mediates signals between the brain and spinal cord. Dyskinetic Cerebral palsy is sometimes described as consisting of two or three variations, which express some but not all of a range of symptoms while sharing the same causes and range of recommended treatments. Although these forms are sometimes distinguished from one another, the terms used to describe them are also frequently used interchangeably. If affected by Cerebral palsy, your child may be affected by some or all of the symptoms for either of the categories listed below - and if you are seeking further clarification on which version your child has, you should consult with a physician. Athetoid Dyskinetic CP: typically affects the arms, hands, feet, or legs of your child, characterized by large or small movements which can vary in being either sudden or slow, jerky and/or sometimes repetitive. These movements often increase during stress, and can also affect your child's face or tongue. Dystonic Dyskinetic CP: typically manifests in random, twisting and sometimes painful motions that occur when your child tries to move. As with Athetoid, these movements can be fast or slow, and repetitive or continuous. There may also be a focal point which is the affected area, or these effects may be more general. What are the Symptoms of Dyskinetic Cerebral Palsy? What is the Cause of Dyskinetic Cerebral Palsy? Fetal Strokes, or bleeding in the brain. These can be induced in a variety of ways, whether through blood clots in the placenta, circulation problems, or weak brain blood vessels. There is a higher risk of fetal strokes if maternal blood pressure is too high or two low - which makes close monitoring of blood pressure key during prenatal care. Maternal infections can also result in fetal strokes. Improper Delivery - if your physician ignored signs of trouble during labor, left the baby stuck in the birth canal, or improperly used forceps or vacuum extraction, that may have contributed to the development of dyskinetic cerebral palsy in your child. Postnatal conditions - Shortly after birth, seizures, jaundice, meningitis, and oxygen deprivation can result in the development of dyskinetic cerebral palsy as a complication, especially if these issues were not promptly diagnosed and treated. How is Dyskinetic Cerebral Palsy Diagnosed? Although dyskinetic cerebral palsy typically results from a traumatic brain injury near the time of birth, it usually cannot be diagnosed until later because its primary symptoms concern motor function. As these symptoms would not become apparent until your child ages and develops motor skills, this condition may not be fully diagnosable for a few months up to a maximum of around eighteen months in severe cases, or three or four years in milder cases. Diagnoses are typically made primarily based on or as a result of observed symptoms, so it is important for parents and doctors alike to notice and follow-up should any signs develop. In addition to basing a diagnosis on the observation of symptoms, your doctor may also want to run a diagnostic test using a variety of imaging equipment. Some of this technology can pose its own risks to health, so it is important to weigh the benefits and drawbacks of any suggestion based on the specifics of your child's case. While monitoring hearing, vision, speech progress, and intellectual development may take more time, it's also likely to result in a more accurate diagnosis. How is Dyskinetic Cerebral Palsy Treated? 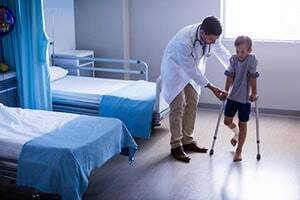 There are a variety of treatments available for dyskinetic cerebral palsy available, and what is right for your child should be determined in full consultation with a physician or other medical expert. Generally, however, physical therapy is considered the most important aspect of treatment and is typically incorporated into the school day to ensure regular and consistent gains are made in areas such as controlling movements and improving posture. In addition, speech therapy can help your child improve their communication skills and overcome eating difficulties, while occupational therapy can provide benefits similar to physical therapy in improving both fine and rough motor skills. Yoga and massages may also provide benefits in terms of muscle relaxation, in a therapeutic, medically-advised context. In addition, various drug therapies or medicines are also available which may help alleviate some symptoms by preventing or controlling spasms. And finally, in certain cases, surgery may also be beneficial in helping to correct or prevent limb deformities.